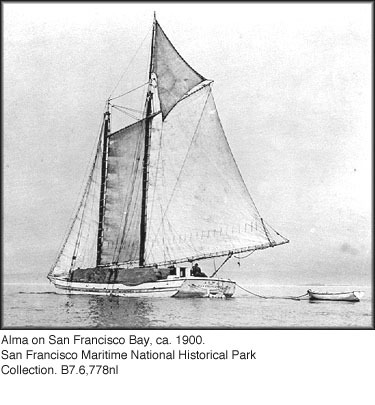 The Alma docked at India Basin, near the historic Hunter’s Point shipyard where the boat was built in 1891. On November 1, the historic ship the Alma set sail from the San Francisco Maritime National Historic Park on the north end of the city, bound for its birthplace, Hunter’s Point, which it hadn’t visited for several decades. The voyage was organized as part of a daylong event launching a series of “Year of the Bay” commemorations and activities in 2013, when the new Bay Bridge opens and the America’s Cup brings elite sailboat racing to the region. “We’ve come together to really open up that celebration to all the communities of the Bay,” said Jon Christensen, Year of the Bay project director and outgoing director of the Bill Lane Center for the American West at Stanford University. Along for the ride on the Alma were several dozen people from a range of organizations, from the Oakland Museum and California Historical Society, which will both mount Bay-themed exhibits in 2013, to the India Basin Neighborhood Association and Literacy for Environmental Justice, grassroots groups based in the Bayview-Hunters Point neighborhood. The crew that sails the Alma, staff and volunteers, are well practiced at teaching just about anyone the basics of raising sail—”Heave!” and “Avast!” called first mate Alice Watts. But no amount of heaving could make the wind blow on this calm day, so we motored the seven miles to Hunter’s Point. Just south of India Basin Shoreline and Heron’s Head Park, the schooner docked at a rather rundown bit of shoreline where local organizers hope someday to house a center for teaching boatbuilding. At the EcoCenter in Heron’s Head Park, an off-the-grid facility that treats its own wastewater, Christensen and collaborator Jon Voss launched the yearofthebay.org website, built by a company called HistoryPin.com that allows people to upload, map, and catalog their own photos, especially historic photos that shed light on the history of the Bay. “People built this Bay. We built this Bay,” said Christensen, chronicling communities from the Ohlone and the Miwok to the Beatniks and hippies who’ve lived and worked along the Bay shore. Now, people can help build the historical record of the Bay as well.